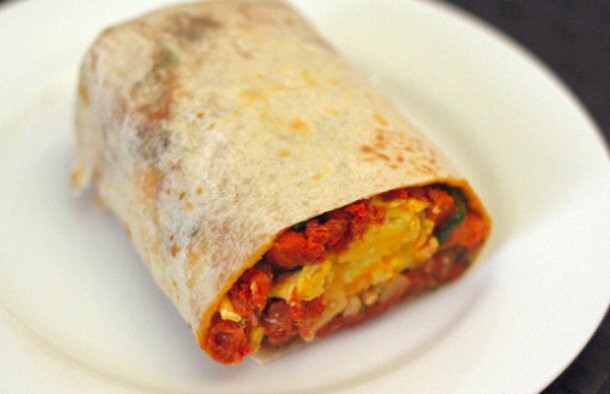 This Portuguese style chouriço and egg burrito recipe makes a delicious breakfast burrito, enjoy. Heat the tablespoon of olive oil in a frying pan. Cook and stir the chouriço over medium heat until well browned and crumbled. Add the onion, chili pepper, and season with salt and pepper to taste. Continue cooking until the onion is slightly browned and set this mixture aside in a bowl. Beat the eggs and add them to the pan, cook them on medium to low heat. Continue cooking and stirring until the eggs are scrambled and no longer runny and set aside in another bowl. Place the flour tortilla in the pan on low heat and let it sit until slightly browned on both sides. Once done, place the tortilla on a plate and spread half the cheddar cheese on top. Now spoon the chouriço mixture into the middle of the tortilla and top with the egg mixture, topping with the rest with cheese. Roll it up like a burrito and serve while hot. 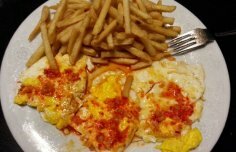 How to make Portuguese fried eggs with garlic sauce. 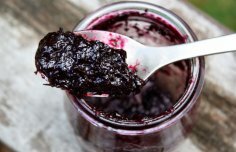 Learn how to make this great food for breakfast, lunch or dinner. 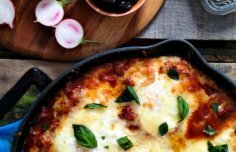 This Portuguese baked eggs recipe is delicious.